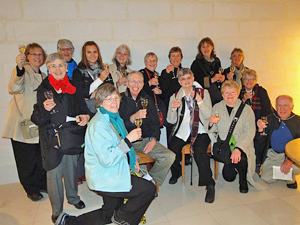 Jeanne Mills' quilters tour to Southwestern France has an opening for TWO people (singles also welcome), due to health issues experienced by two participants who have had to drop out. She must provide final counts to vendors within two weeks, so if you have a passport and can make a swift decision, read about this trip here and contact Jeanne. My predictable Internet outages are playing havoc with my blogging schedule. Yes, I suppose I could blog in the daytime, but since my general plan was to provide something of a narrative of daily life, if I spend the day writing, I'll have even less to tell than I do if I wait until evening. Not much happens in the evening, compared to my days of mystery and excitement. Wait. That's Jessica Fletcher. Sister and Brother-in-law ordered the calamares for an appetizer. I expressed the hope that it wouldn't look like a plateful of deep-fried tarantulas like a cousin-in-law had once been served, to her horror (and mine, too). These were fried in a spicy batter and served with an even spicier sauce, adding a very nice bite to the mild flavor of calamares. We three thought it a little too salty; it tasted like sea salt, given a sharp shake over the plate, and we expressed that opinion to the new assistant manager of the restaurant, who transmitted it to the chef. Sister and I had tomato basil soup for starters, while Brother-in-law had the salad. She chose a red wine from Ironstone, as she'd been wanting to try some. Brother-in-law contemplated and contemplated, and, finally, before we all died of hunger, asked for the house merlot. Don't ask me for details about wine. I can tell you about the water. Assistant manager graciously came back with an offer to comp our desserts to make up for the salt. He apparently told our waitress about it just then, because she came by to ask us whether we were ready for dessert yet. It was crowded in the restaurant. She missed the part where we needed dinner first, so we all had a good laugh. I chose this center cut sirloin from the "smaller dinner" menu, with the garlic mashed potatoes and the best seasonal vegetable of all. I'm never sure how a chef will interpret "medium-rare" but this steak was perfect under the crisp onion rings. Sister also chose from the smaller dinner menu, ordering the seared salmon with the great sauce whose name I can never remember. Brother-in-law, eyes bigger than his stomach, ordered two pork chops from the big boys' menu. We know what he had to eat for lunch the next day. My sister had the photogenic Lava Cake. Brother-in-law and I chose the berry cobbler with ice cream. We stayed to listen to the band for awhile, then adjourned to my house, where I introduced Sister to the addictive People recognition feature of Picasa 3 photo software. It dutifully scans every photo in my computer, of which there are thousands, and pulls out all the faces for identification and tagging. It's not super picky about faces, including those from statues on the front of Notre Dame, of portraits on the wall and faces of Jesus and saints in the stained glass windows my father designed. This one is unique. 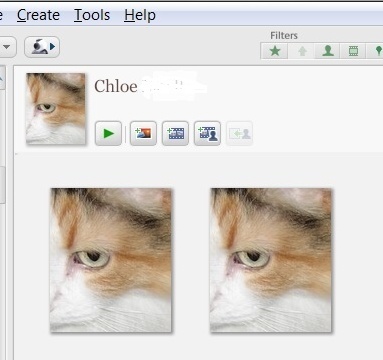 I'm still waiting for Picasa to identify other shots of Chloe, but this is all so far. See you tomorrow, Internet conditions willing. I just had an aha moment reading your blog - Jessica Fletcher! That is who you remind me of - smart, writer, good at figuring things out, maybe a few of the same mannerisms. Couldn't remember the character name. I had to Google Angela Landsbury to find it.